When she moved her young family to her husband's hometown in northern France, Karen Le Billon was prepared for some cultural adjustment. But she was most surprised by the food education she and her family (at first unwillingly) received. In contrast to her North American daughters, Le Billon found, French children fed themselves neatly and happily, eating everything from beets to broccoli, salad to spinach, mussels to muesli. Her own family's food habits soon came under scrutiny, as Le Billon got lectured for slipping her fussing toddler a snack — "a recipe for obesity!" — and forbidden from packing her older daughter a lunch in lieu of the elaborate school meal. 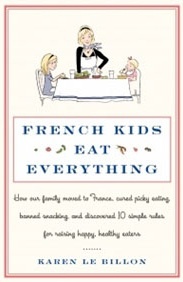 The family soon began to see the wisdom in the "food rules" that help the French foster healthy eating habits and good manners, from the rigid "no snacking" rule to common-sense food routines that we used to share but have somehow forgotten. With time, the Le Billon family cured picky eating and learned to love trying new foods. But the real challenge arrived when they moved back to North America, where their commitment to "eating French" was put to the test. The result is a family food revolution with surprising but happy results. With tips, tricks, rules, and routines for happy, healthy eaters — plus some fast, tasty recipes to try — this isn't just another tale of Gallic gastronomic superiority, but a practical guide to instilling in your kids healthy eating habits that will last them a lifetime.